In honor of the newly redesigned MSN for Windows 8, I'm sharing time when I've reimagined or redesigned an aspect of my life, blog, or career. Thing is... I'm always reimagining! I reimagine on a daily basis, but there's one thing I find myself reimagining more than anything else: my living space! Reimagination is at the heart of my budget-friendly, crafty, creative, personalized decorating style and do-it-yourself projects. Not only am I a chronic furniture rearranger who has been known to move around furniture three times in one week... but I'm a hopelessly romantic reimaginer of antique shop and thrift store finds. I love combing through the items of bygone eras in a dusty antique store crammed with treasure among the junk. And you'll often find me rummaging through the shelves of Goodwill for something spectacular amid the secondhand. I reimagine. I revamp and reuse and rejuvenate. I like to take something ordinary and redisgn it into something extraordinary. I like to take something old and rusty to renovate into something pretty. I like to repurpose something as something else. And if you really practice your reimagining, the possibilities are quite endless. One man's trash is another man's treasure. The saying may sound cliche, but it's spot-on when it comes to reimagining. Antique, thrift, vintage, consignment, and secondhand stores are goldmines when it comes to finding junky stuff to revamp as funky decor. Sift through everything for cheap finds with potential. Picture frames, candle holders, nightstands, headboards, baskets, bookends, vases, etc. and a new life as a magazine holder. See the before and after in this post. Don't look at what something is. Look at the potential in an object. Imagine what it could be with a little bit of TLC (a.k.a. paint, spray paint, fabric, wallpaper, stencils, sparkles). An old brass candle holder could be given new life with a few coats of fabulous hot pinks spray paint. An antique dresser would look spectacular painted a bright mustard hue. Reupholster a tired vintage chair in a fresh floral pattern. Cover a bulletin board in fabric. Wallpaper a boring headboard. Stencil a design onto the top of a thrifted desk. This antique chair had a great silhouette and style, but its hideous golf-print upholstery didn't fit in with my decorating style. So I rejuvenated it with spray paint and a fabric paint mixture. Check out the DIY post here. him a few coats of pale blue spray paint. See the before and after here. A boring desk lamp got a makeover using lace and spray paint. See the transformation here. 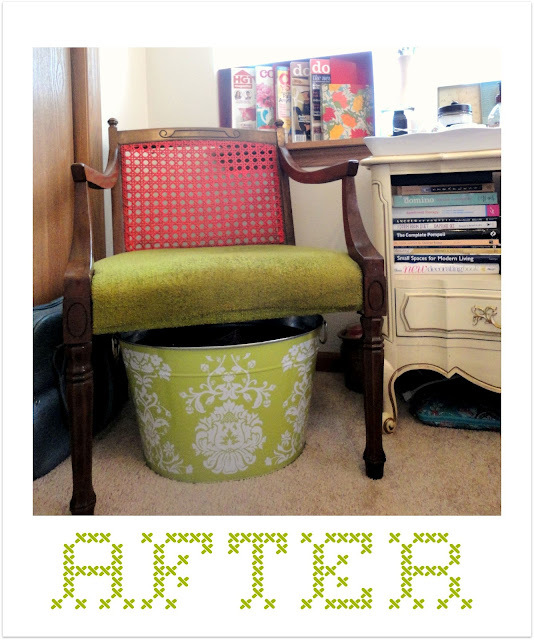 Check out the before and after face-lift I gave this vintage chair with a little paint in this diy post. 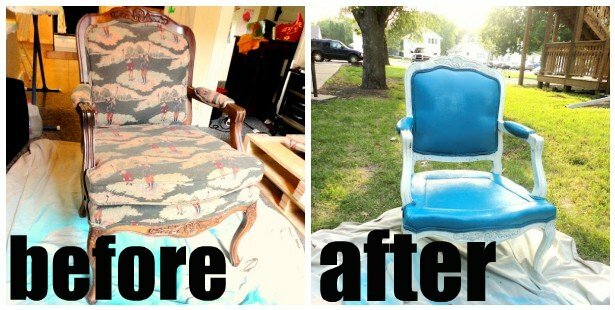 Giving a chair a face-life with a coat of spray paint is one thing, but take it a step further by remaking an object. Look at it and think of a different purpose. A pretty teacup could be used as a candle holder. Deer antlers could be turned into hooks to hold necklaces, scarves, or purses. Beer and wine bottles can be transformed into lovely vases. Use an old iron gate or antique door as a headboard. Create a sofa or bed base out of wooden pallets. I repurposed the pages from an old book as wallpaper in my bed nook. Check out the post here. After bringing in your renovated furniture, rejuvenated decor, and repurposed accessories, look at your space on a large scale level. Reimagine the room painted a different color, then go for it! Reimagine the windows framed with bright, colorful curtains or white sheers. Reimagine a big, bold rug on the floor... or the hardwood that might be lurking underneath. I use different bedding for springtime and summer than I do for fall and winter. I like change. I like switching up my perspective on a frequent basis. And so, I rearrange my furniture a lot. Sometimes I just swap a dresser with a desk. Sometimes I rearrange the entire room. Play with furniture arrangement and don't be afraid to try something new and different. Position pieces at new angles. Create zones and nooks. If you don't like it, you can always switch it back. Refresh by decluttering and cleaning. Burn a new candle fragrance. Turn your comforter over to the reverse side. One of the times I rearranged furniture, I created a writing nook for noveling, blogging, and studying. Imagination is one thing, reimagination takes it a step further. Embrace change. Embrace creativity. You don't need a lot of money or square footage to create a functional and lovely living space that shows off your style and personality. You just need to reimagine! What is something you've reimagined in your living space? Or what's something you're having trouble reimagining? This post was created in partnership with MSN. Find out more about the all new MSN experience at allnew.msn.com or see it in action on Windows 8, Android, or on iOS at msn.com. I kind of feel like your blog has partly turned into a Windows advertisement. :/ But some useful advice nonetheless!